May 20 will be a very special day for sixteen Arrowhead Park Early College High School (APECHS) and Arrowhead Park Medical Academy (APMA) students, one Centennial High School student, and their sponsors, Jeffrey Johnson and Tamara Miller-Dwake. That’s when they will travel to Nienburg on the Weser River, Las Cruces’s German Sister City. For three full weeks, they will experience family, community and school life, interspersed with excursions to nearby cities such as Hamburg and Bremerhaven as well as to Berlin, Germany’s capital. They will be returning the visit of eighteen German exchange students, accompanied by teachers Mirko Prasse and Hedda Freese, who came to Las Cruces and Arrowhead this past fall. In 1986/87, the student exchange started between Albert-Schweitzer-Schule/Nienburg and Mayfield High School, where it continued for more than twenty years. It then moved to Centennial and has been at Arrowhead since 2015. For three exchange cycles, it has not just taken place within the framework of the German American Partnership Program (GAPP) but also under the umbrella of the Las Cruces-Nienburg Sister Cities Affiliation, which arose from the student exchange in 1993. In preparation for their stay in Germany, most Arrowhead students are taking Oklahoma State University’s German Level 1 Online course. In addition, nine of them completed eighteen German ‘Konversation’ hours with retired Mayfield German instructor Ingrid Luchini, who introduced the GAPP to Las Cruces and sponsored it for the first fifteen years. (The Centennial student is in a regular German program with a teacher.) On March 20, 2019 these ten students received scholarships towards their travel expenses. Four $500 scholarships from the Las Cruces-Nienburg Sister Cities Affiliation were awarded to Kim Casares, Clyde Miller, Sophia Moore and Zoe Palazzolo. Two $500 scholarships from the local Freunde der deutschen Sprache/Friends of the German Language went to Janos Braun and Daniela Robinson. Two $500 Gavin Luchini scholarships were received by Nathan Rukovena and Gabriel Stookey. Two $400 Gavin Luchini scholarships went to Tirza Baca and Jillian Johnson. 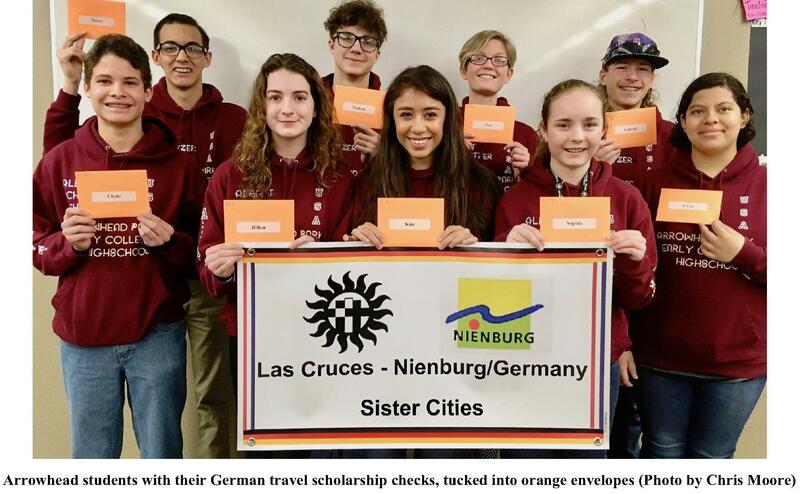 Las Cruces-Nienburg Sister Cities Affiliation Co-Chair Erda Hillmann, Friends of the German Language member Veronika Barnes, and Las Cruces-Nienburg Youth Exchange Organizer Luchini presented the checks. 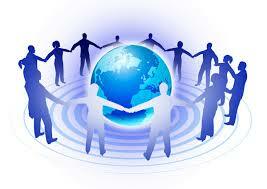 The three are active in both organizations. Please see the attached photo and comments from our guests from Nienburg. The Arrowhead Park High Schools, Las Cruces, NM, USA and the Albert-Schweitzer-Schule, Nienburg/Weser, NI, DE Student Exchange coming 9-22 to 10-13, 2018. Please view the following picture. Note: Words written the same but pronounced differently in two languages often have different meanings. The acronym for ‘Albert-Schweitzer-Schule’ translates from the German as ‘Ace’, that is ‘The Best’. Here is the latest information on the exchange coming this fall. Thank you Ingrid Luchini for the update. Attached is a letter about the travels of 12 Arrowhead students to Germany. Please read the attached article about the Arrowhead Park High School German exchange. Please see the attached PDF file for an update on the German Youth Exchange with Arrowhead Park High School. Please read the attached report on the youth exchange with the Albert_Schweitzer-Schule from Nienburg, Germany. Lucari shows in this report what a great time he has had.